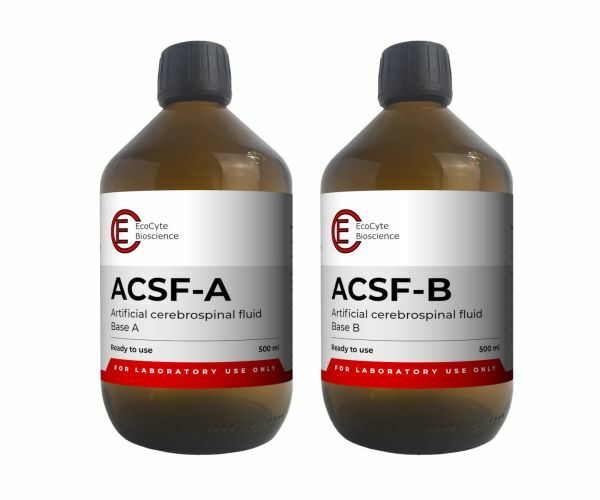 Produktinformationen "ACSF - Artificial Cerebrospinal Fluid (1000 ml)"
Artificial cerebrospinal fluid (aCSF) is a biological buffer that enables a vital environment for neuronal tissue by maintaining the homeostasis, osmolarity, and pH at physiological levels. ACSF is commonly used for many lab experiments including in vitro and in vivo applications. Carbogen (95% oxygen and 5% carbon dioxide) supply is necessary for proper Bicarbonate pH buffering. Weiterführende Links zu "ACSF - Artificial Cerebrospinal Fluid (1000 ml)"
Kundenbewertungen für "ACSF - Artificial Cerebrospinal Fluid (1000 ml)"